On a recent trip to Costa Rica I saw 13 species of owl. This blog pot discusses those species that I managed to get good photos of, which is most of the country’s owls. 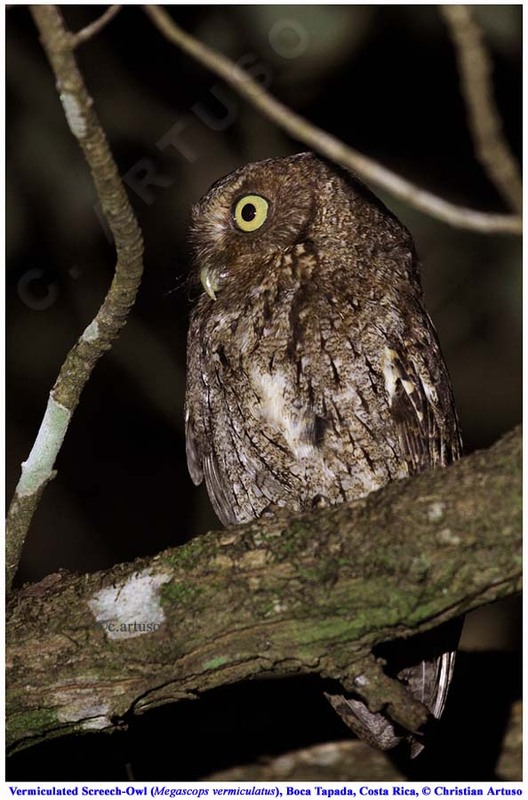 The Bare-shanked Screech-Owl is endemic to the mountains of Costa Rica, Panama and extreme northwestern Colombia (from approx.. 900m – 3200m ASL but usually more common in the mid elevation cloud forest and humid forest). The first photo shows the bare shanks that gives the species its name. The second photo shows the wing droop display posture when delivering the territorial song. This is a red morph individual, which seemed more common in the parts of Costa Rica I visited than the dark brown morph. The Pacific Screech-Owl occurs in a relatively narrow strip along the Pacific coast from southwestern Mexico (Oaxaca and Chiapas) to northwestern Costa Rica (mostly Guanacaste). This is a resident of dry forest types (also mangroves in some contexts), mostly in the lowlands but sometimes as high as 1000m ASL, although this individual photographed by Adrian Arroyo and myself in Monteverde, Costa Rica is at roughly 1300m ASL. Although common in its limited range, this is a poorly known species. This is one of the few species of Megascops that is not known to have a red morph (this follows the general pattern of higher prevalence of red morph birds in humid environments). * (Megascops guatemalae or vermiculatus), reddish-brown morph, Boca Tapada, Costa Rica. 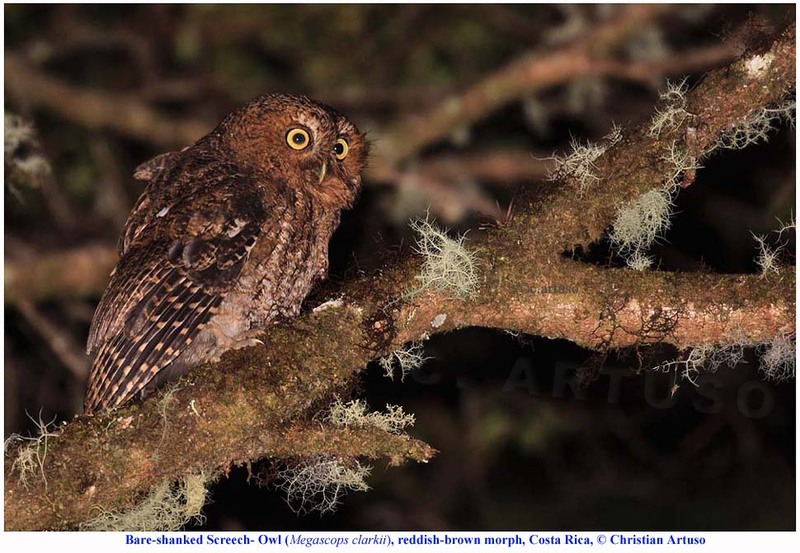 With the help of Adrian Mendez and Adrian Arroyo, I photographed this brown individual (first two photos) in Monteverde on the Pacific slope at approximately 1300 m ASL. I photographed this reddish-brown individual (third and fourth photos) near Boca Tapada in the Caribbean lowlands in the extreme north of the country. The issue for me was that the bird in Monteverde gave what I consider to be a typical song for M. vermiculatus, i.e. a very rapid trill that lasted approx. 8 seconds, whereas the bird I heard in Boca Tapada gave a very long trill that I timed at 20 seconds in duration and which struck me as more akin to M. guatemalae. Based on song along, I was inclined to think that two different species are present in Costa Rica (based on the split of the M. guatemalae complex into multiple species). The physical features of these birds therefore leave me with some doubts. Of course, the morphs are not the same so direct comparison is not really possible. 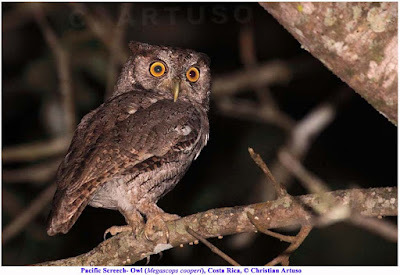 In the end though, the long song of the bird in the Caribbean lowlands versus the short song of the bird on the Pacific slope suggests to me that the status of the screech-owls in Costa Rica warrants further investigation and clarification. 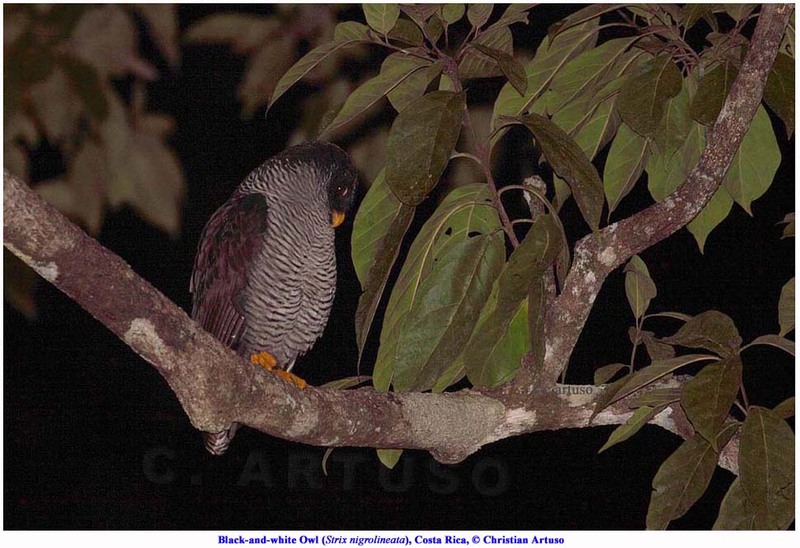 This is something that some budding Costa Rican birders and ornithologists might like to investigate! 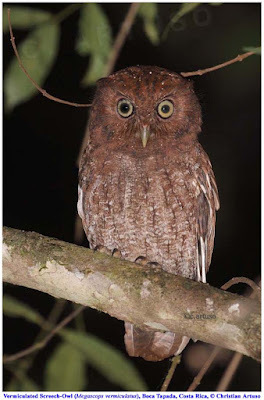 The unique (monotypic genus) and spectacular Crested Owl is always a special treat to observe. 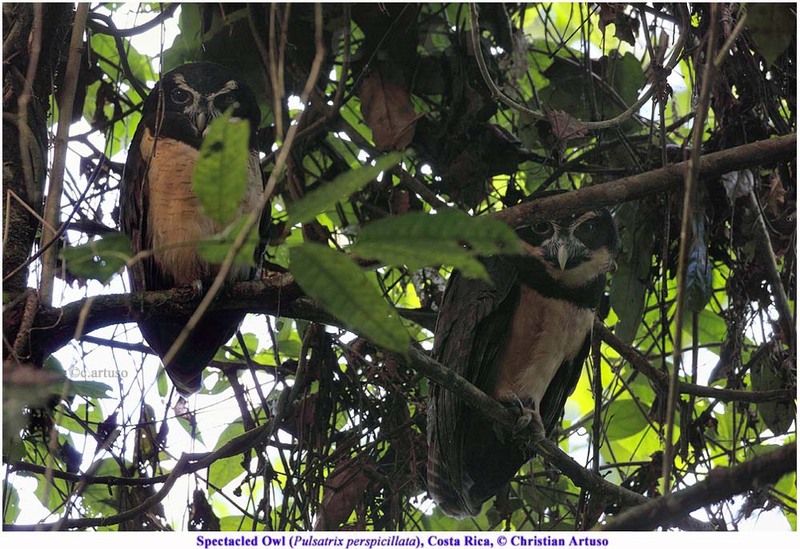 In this case, special thanks go to Jose (Cope) Arte who found this roosting pair of Crested Owls in the Caribbean lowlands of Costa Rica. You will notice that one of these owls has a cataract in one eye, although that does not seem to have weakened the pair bond between these two. Although it is very hard to tell in this particular photo, when observed from two angles, I felt the owl with the cataract was very slightly larger and hence probably female. 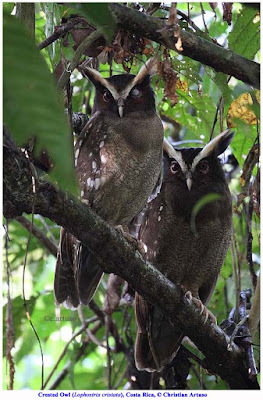 The Crested Owl is a widespread, mostly lowland rainforest species, though sometimes found as high as 2,000 m ASL. The subspecies found in Central America is L. c. stricklandi. 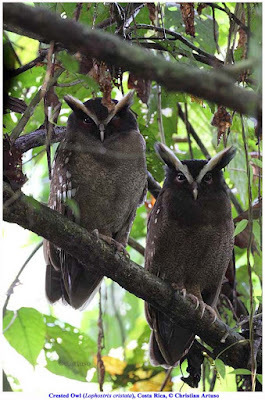 The slight colour difference between the pair was interesting and when I compare these individuals to Crested Owls I have seen in Mexico (click left arrow) they don’t seem to be quite as reddish in the face. The Central American birds are much darker than birds from Ecuador and Peru. Some have argued that may warrant a future split since the distribution is disjunct, with the Amazonian population being separated geographically from the Central America and northwestern (Pacific) South American birds. With thanks again to Cope Arte, I was delighted to get a chance to see this pair of Spectacled Owls on a day roost. 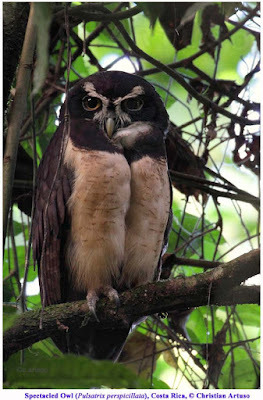 Spectacled Owl is the largest (can reach 52 cm in length) and most widespread member of the genus Pulsatrix. 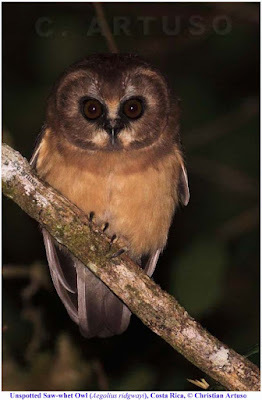 This genus is confined to the Neotropics and has only three species (some authors split Spectacled Owl into two species, giving rise to a fourth species, but this is not widely accepted). The first photo is a crop showing one more closely to reveal the exceptionally beautiful pattern and and the second photo shows the pair together. 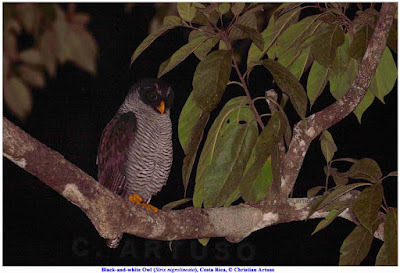 The Black-and-white Owl is one of two Neotropical species with a unique jet black on white plumage, offset by yellow bare part colouration (possibly a third species exists, the San Isidro mystery owl). Black-and-white Owl is found in Central America (south from southernmost Mexico) and long the Pacific coast of northern South America (as far south as extreme northern Peru) and east across northernmost Venezuela. This is a large owl (females can measure as much as 40 cm in length) with a distinct guttural song. Despite their large size they seem to consume a lot of invertebrates. 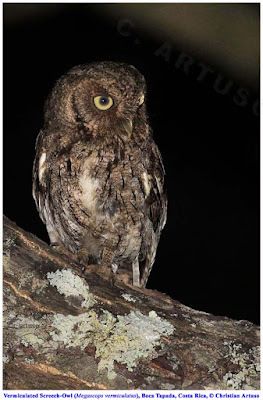 This bird came around the lights of the Laguna Lagarto lodge at night, seemingly looking for moths and perhaps also bats. Mikkola (2014) states that Black-and-white Owl and Black-banded Owl “clearly overlap in range in Colombia”; however, examination of range maps from a variety of sources suggests this is not the case. Mottled Owl is a widespread species (unless you accept the proposed split of the Central American taxon) that occupies a wide variety of habitats and a considerable altitudinal range; for example I heard one at approximately 2400 m ASL on Volcán Irazú. I have found it to be very common in many parts of the Neotropics, with the possible exception of the Atlantic rainforests of Brazil, where a disjunct population occurs that seems more thinly distributed. This bird is more buffy below than others I have photographed in Mexico (possibly a question of colour morph). 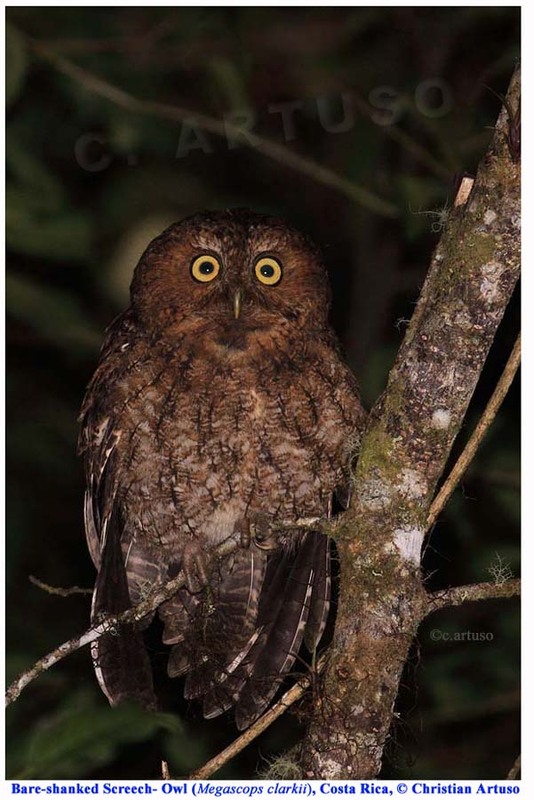 The Costa Rican Pygmy-Owl is endemic to the mountains of Costa Rica and western Panama (rarely as low as 900m ASL but usually from ~1200 – 3400m ASL). For the most direct comparison I combined two photos into a collage showing the two colour morphs, red and brown. 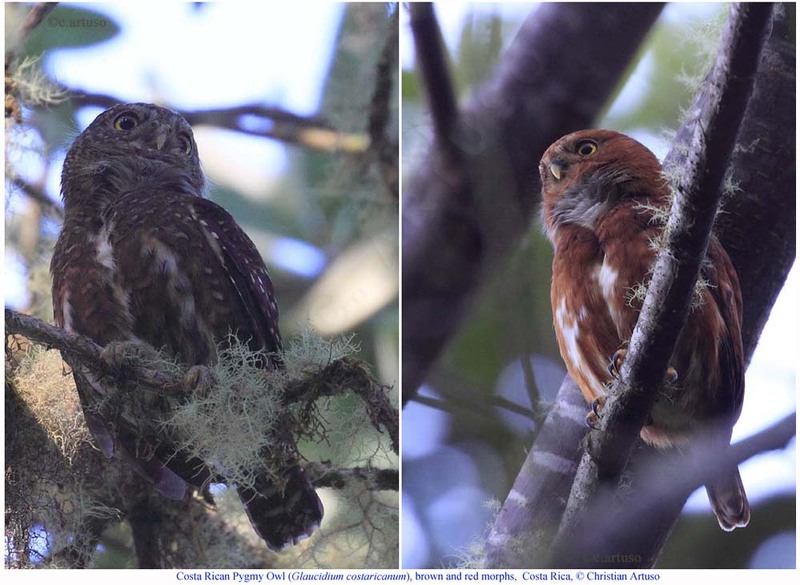 As discussed previously (see my previous post on polychromatism), colour morphs are common in the pygmy-owls (genus Glaucidum) and this species has two morphs. 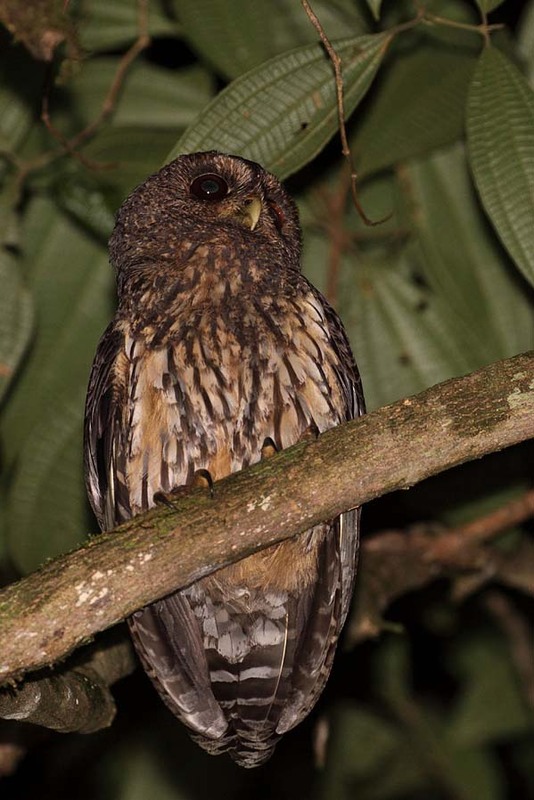 This taxon is now widely considered to be a full species; although it was formerly considered to be a subspecies of Andean Pygmy-Owl (genetic analysis suggests it is more closely related to Mountain Pygmy-Owl). 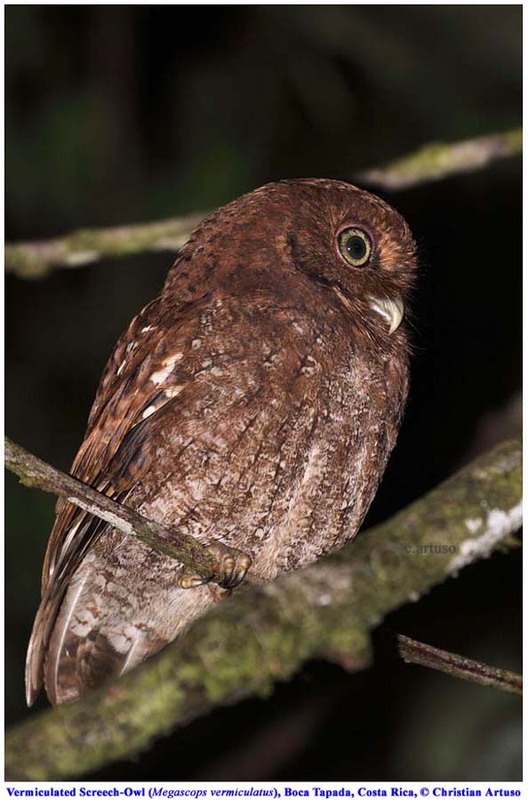 The Ferruginous Pygmy-Owl is one of the most widespread of the Pygmy-owls (at least in the broadest sense as currently recognised by the IOC). In Costa Rica this species only occurs in the dry northwestern part of the country. This individual was photographed at Palo Verde in the early morning. An avian enigma that is rarely seen, the Unspotted Saw-whet Owl (Aegolius ridgwayi) is a close relative of the Northern Saw-whet Owl and they have in the past been considered conspecific by some. I was absolutely delighted to spot the unspotted perched quietly in some liana vines beside a small road at approximately at 2400 m above sea level near Los Quetzales National Park, Costa Rica after working hard to try to hear one. Even better, I got to share my find with some ecstatic Costa Rican birders a couple of days later. Some taxonomists consider this to be the nominate subspecies, although others consider this species to be monotypic. 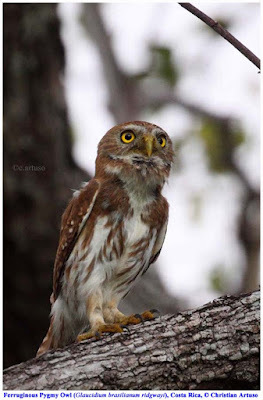 Unspotted Saw-whet Owl is the only extant species in the genus Aegolius from Mesoamerica. In addition there is one species from South America (Buff-fronted Owl) and two from North America (the Northern Saw-whet Owl and the Boreal Owl, which in addition to North America also occurs across northern Eurasia). An additional Caribbean species, the Bermuda Saw-whet Owl (Aegolius gradyi) is now considered extinct. 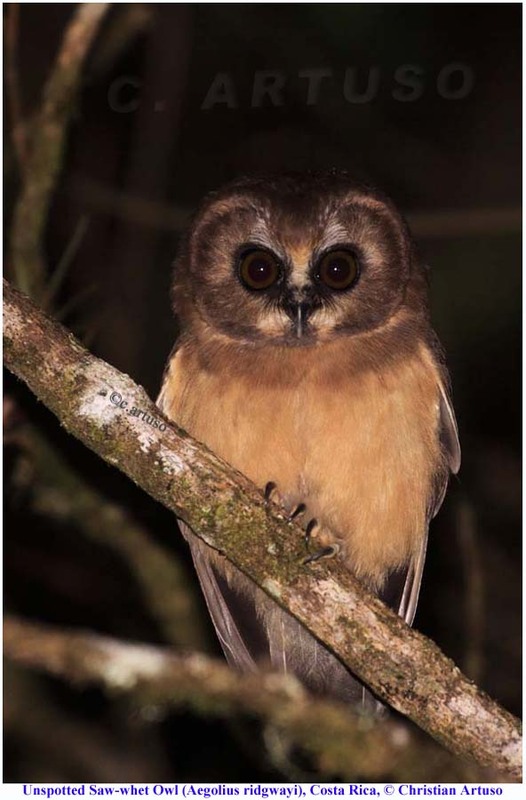 One of things I find most fascinating about the Unspottted Saw-whet Owl is that their adult plumage is extremely similar to the juvenal plumage of Northern Saw-whet Owl. Although there are many closely related bird species pairs where juvenal plumages or female plumages are very similar, and of course some where all adult plumages are similar, this seems like a rare case in the avian world where a species’ adult plumage closely resembles the distinct juvenal plumage of congenitors (making them rather Peter Pan-like in appearance, i.e. they give the impression of having never grown up). There are cases of individual birds from different taxa breeding in juvenal or subadult plumages but the evolutionary mechanism involved in this case remains unclear. Wow!! Those are some fantastic owls and photos. 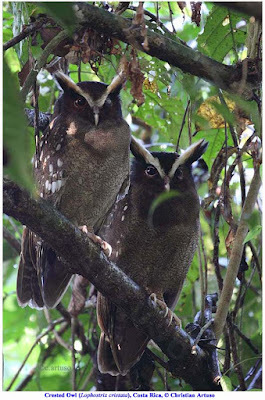 I especially like the Crested Owls and Unspotted Owls. How much would the cataract effect its vision? It must be harder to hunt. There seems to be a lot of controversy about species here.. The cataract probably impacts vision and makes it harder to hunt but the individual has learned to adjust. In owls, biparental care is the norm so this would lesson the pressure on the bird with the cataract during breeding season. In the tropics, we know a lot less about owls and as a result it is not always clear where species boundaries occur. There is a lot to learn and that is exiting too in a way. Great blog, I will add you to my list! Gr. John from Holland. Resplendent Quetzal - a peculiar tail!